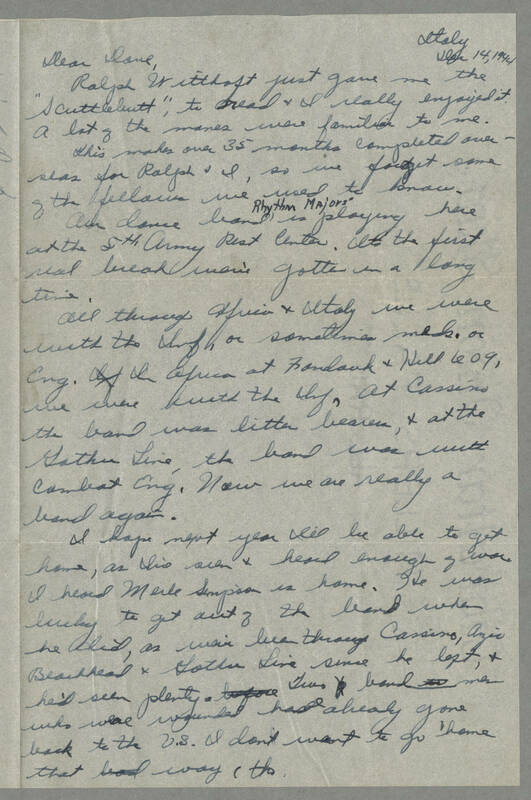 Italy Dec 14, 1944 Dear Dave, Ralph Witthoft just gave me the "Scuttlebutt", to read & I really enjoyed it. A lot of the names were familiar to me. This makes over 35 months completed overseas for Ralph & I, so we forget some of the fellows we used to know. Our dance band, "Rhythm Majors", is playing here at the 5th Army Rest Center. Its the first real break we've gotten in a long time. All through Africa and Italy we were with the Inf., or sometimes meds. or Eng. In Africa at Fondovk & Hill 609, we were with the Inf, at Cassino the band was litter bearers, & at the Gothe Line, the band was with Combat Eng. Now we are really a band again. I hope next year I'll be able to get home, as I've seen & heard enough of war. I heard Merle Simpson is home. He was lucky to get out of the band when he did, as we've been through Cassino, Anzio Beachhead, and Gothe Line since he left, & he'd seen plenty. Two band men who were wounded have already gone back to the U.S. I don't want to go home that way, tho.